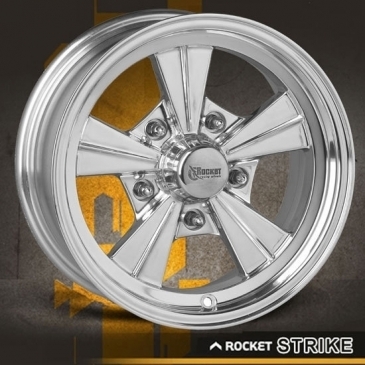 The Rocket Strike provides timeless and classic traditional styling at very affordable prices. The Rocket Strike is precision-crafted from A356 aluminum and topped off with a vintage style aluminum o-ring center cap. The Rocket Strike will be available in Fully Polished and As Cast Finishes. 1-pc Cast Aluminum A356 Fully Polished - Rear Wheel Drive Offsets - Polished Aluminum Snap-in O-Ring Cap Included - Lug Centric - Standard Conical Seat 60 Degree Lugs sold separately - 3.00" hub clearance under center cap - Load Rating 1560 lbs per wheel RPM is committed to producing cutting-edge alloy wheels through performance and innovation with the highest quality standards to enhance the performance and appearance. The ultimate result is that your ride will get noticed at the next cruise-in or car show. To better serve the market, RPM designers and engineers carefully chose better backspacing and offsets to fit on more specific types of muscle car, street rod, hot rod applications. NEW 17" Sizes Now in Stock!